For a birthday party magic show, The Mad Hatter can’t be beat! Played by award-winning Melbourne magician Tim Ellis, he’s the craziest and most outrageous guest you could ever invite to a party! As soon as he arrives at the door the antics begin. He wants to take over the party and run things his way – and his way means an hysterical Birthday party magic show before getting stuck into the food. You’ll be amazed at what he pulls out of his bag of tricks – and he varies his show to cater for specific age groups as well – so every Birthday party magic show is different. Objects appear, disappear, levitate, and end up in the most unusual places! 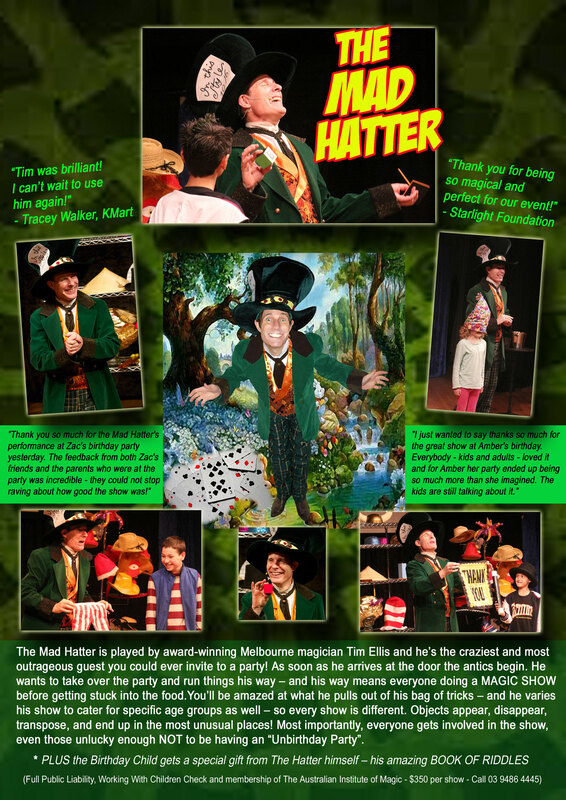 If you want to see your kids laughing and giggling in uncontrollable hysterics, while simultaneously being amazed at the best Birthday party magic show in Australia, call Magic Unlimited on 040 88 62442 right now and ask for THE MAD HATTER! I was rapt you were able to hold the attention of 25+ little people for 45 minutes, and was surprised to see that so many of the adults were greatly entertained by the show too. Even my 90-year-old father-in-law was right into it. We are still talking about your head shrinking trick.